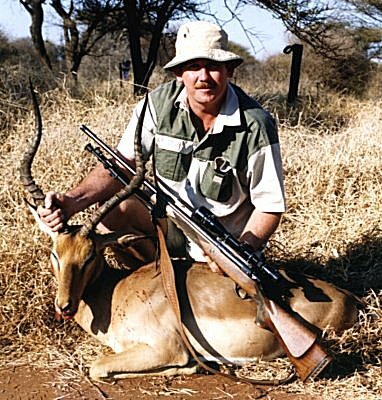 Chris Ruytenberg of Port Elizabeth with a 26" Impala shot on the farm "Koedoeskuil" in the Thabazimbi district. The head shot was at about 100 metres and taken with a 30-06 rifle hand-loaded with 150 grain GS Custom HP bullets at 3000 fps. (308150HP.014) Though this was an easy shot, Chris maintains that the accuracy that he achieves with GS Custom HP bullets, enables him to take longer shots with much more confidence than ever before. 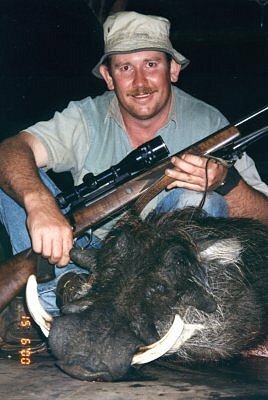 Chris with a warthog also taken at Koedoeskuil on the same weekend. The shot was at 150 metres with his 30-06 and the 150 grain HP bullet. He uses the same load for bush and plains game. See the article on bullet momentum on the HV Bullets page titled Momentum v Energy.